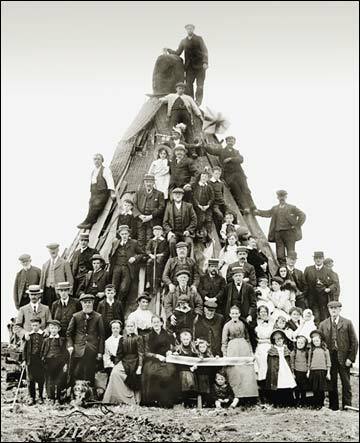 Milltown Memories 12: God Save the King! 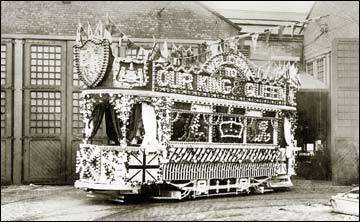 Splendid enough to grace the Blackpool illuminations, this magnificent tram was specially decorated for the visit to Halifax in 1908 of King Edward Vll and Queen Alexandra. It adorned a postcard sent to Hebden Bridge - in those days trams also carried the mail so this could well have been delivered in truly spectacular style! Reproduced by kind permission of Mrs Gill. Code no AT626. Three kings were crowned - and one abdicated - during the first four decades of the 20th century. Never slow in seizing the opportunity for a right royal knees-up, the upper Calder Valley marked each Coronation with gusto. The crowning of Edward V11 in 1902, planned for June 23, had to be postponed because of a health scare. 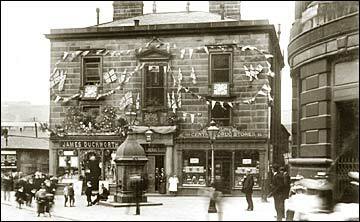 The new king was well enough for the Coronation to take place on August 9 and flags and bunting be-decked the streets throughout the Valley. Celebrations for the Coronation of George V on June 23 1911 were more lavish: the triumphal archway in Hebden Bridge, spanning the junction of New Road and Bridge Gate, remained a glorious spectacle for several weeks. George V1 was crowned on May 12 1937 - although the event was still over-shadowed by the abdication the previous year, of his brother, Edward V111. Despite the damp and drizzly weather an ox-roasting in Halifax went ahead - over 2,000 steak sandwiches were handed out. The roar of a 21-gun salute greeted King George V1 and Queen Elizabeth when they visited Halifax five months later. The 4th Battalion Duke of Wellington's Regiment formed a 100-strong guard of honour and 10,000 school children from all over the Calder Valley cheered their heads off in Savile Park.